This year we have been allocated a large stand quite close to the entrance to Hall 3. Stand number 3-455. That was almost two weeks ago and has been well reported on the Facebook page. For those who don't follow Facebook, however, I can report that it was another really good show. Yes, this year we got the real Fuzz Townsend. Meredith cornered him and wouldn't let him escape before posing for a photo. 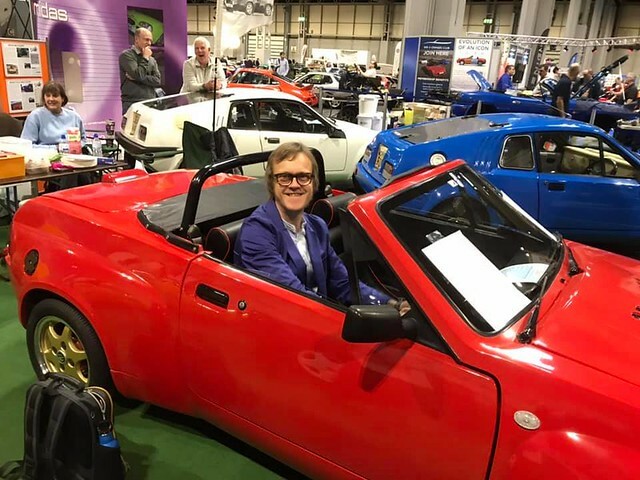 I spoke with Alex Riley (The One Show, The Classic Car Show, Fifth Gear, etc) at last year's show. He is a real Midas fan, but had never sat in one before. So this year we gave him the chance to try Streetsy's red Convertible for size. 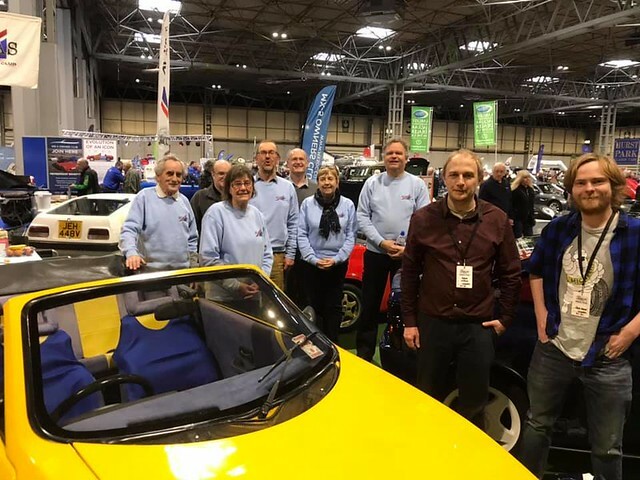 Adam Wilkins and Jack Wood of Complete Kit Car magazine were having a staff outing at the show and were happy to join the crew of the MOC stand for a group photo. 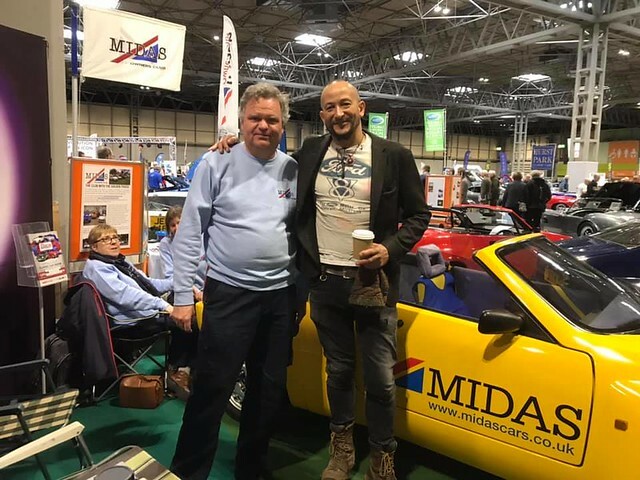 Jack currently has a Mk2 Midas Coupe and you can follow his experiences with the car in the magazine, while Adam was the previous keeper of my yellow Excelsior, so there was plenty of enthusiasm from them to feature the cars in future issues. It didn't wake him, but the sound of our laughter did. 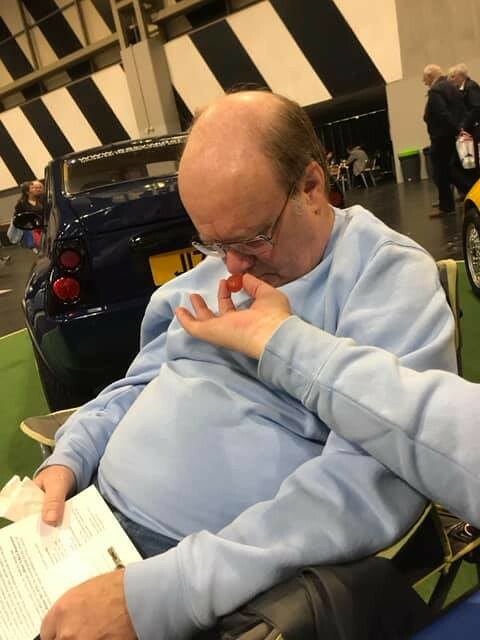 I must finish by saying a big thank you to the guys who brought their cars along - Neil, Brian, Richard and Justin - as well as all those who helped out on the stand over the three days. It was good to see some new faces this year along with the regulars. It was a great show and well worth it.